Two more Devon and Cornwall lines are going into an experimental government programme aimed at giving rural railways a better financial footing. 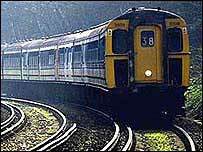 The Tamar Valley and Looe Valley lines are joining St Ives in a group of six railway routes where new rules apply. The Strategic Rail Authority has been examining new ways of operating local branch lines. The Community Rail Development Strategy aims to increase the number of passengers using rural rail lines. The government usually has to heavily subsidise branch lines but wants to find ways of making them work without that need. Now it is piloting a scheme where local councils and other groups come up with new ideas for potential funding. The latest two lines to become Community Rail Routes are the 15-mile Tamar Valley line from Plymouth to Gunnislake, and the nine-mile Looe Valley line which starts at Liskeard. The campaign group Rail Future says so far the policy has worked well. The first Cornish line designated, St Ives, has been upgraded with trains running at half-hourly intervals, and there has been a station refurbishment at St Ives. Will rail review improve services?